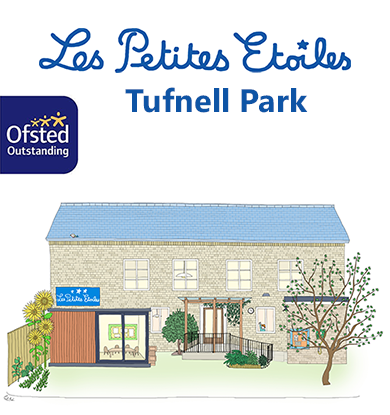 Les Petites Etoiles welcomes children between the ages of 1 and 5. We are open 47 weeks a year. Children are welcome to arrive at any time between 8 am and 9 am. The school day begins at 9 am. During the day the children will have access to the garden. We will serve a morning snack, lunch and an afternoon tea at 4.10 pm. Parents can collect their children at 4 o’clock just before tea or at any time between 4.30 pm and 6 pm. Our Nursery Manager, Françoise Fourmond, takes care of all the day-to-day running of the school. Either Françoise or our deputy manager, will show you around the school when you book a visit. Visits are usually at 10 am. Our educational program will follow and adhere to both the Early Years Foundation Stage (EYFS) and the French Curriculum. We prepare children so that they can enter either the “Moyenne Section” or “Grande Section” of the French school or Reception of the British educational system. To meet the French educational requirements, children who are in the “Petite Section” (children who are at least 2 years and 7 months old on 1st September) must come to Les Petites Etoiles full-time. Part-time places will be available for children who are aged 1 year to 2 years and 8 months on the 1st September. Copyright © 2018 lespetitesetoiles.uk. All Rights Reserved.